1743 French Map of Northwest Africa, depicting the areas covered in this curriculum unit. The ancient city of Timbuktu lies in West Africa in the present-day nation of Mali. This is a region of varied landscapes, ranging from sizzling desert sands to tropical jungle. The Niger River that flows through Mali has been an important trading highway as well as a source of subsistence for the local people since very early times. The first thing people back home will ask you is “Where in the world is Timbuktu?” Before you set out, better open up those maps and take a look. You already know Timbuktu's in Mali, but where's Mali? And what's the landscape like there? How do you get around in Mali? And what's the weather like? You've got a bunch of maps in front of you. Where to start? Why not begin with the one taken from outer space? 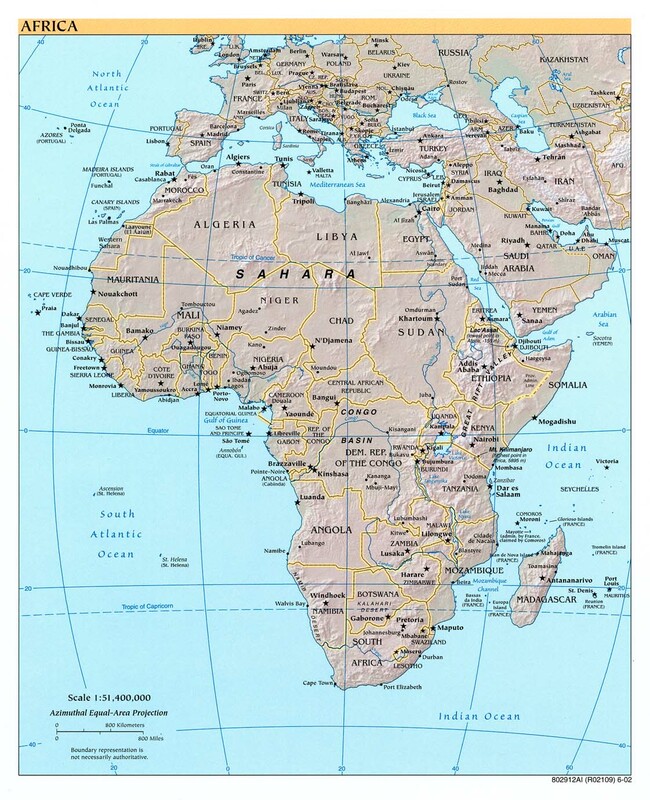 Access Map of Africa: This is a satellite map. Notice how the Sahara Desert (the tan area) covers the entire northern part of Africa, with the exception of a few coastal areas. Look at the western bulge of the continent. The parts of this bulge that lie along the edge of the desert and south of it make up a region known as West Africa. Go to Map of Africa: This is a political map. Put your finger on Mali. Now find each of the other modern countries of West Africa: Mauritania, Niger, Nigeria, Senegal, The Gambia, Guinea-Bissau, Guinea, Sierra Leone, Liberia, Cote D'Ivoire, Burkina Faso, Ghana, Togo, Benin. Go to Map of Africa. Find Mali and Timbuktu. What is the capital of modern Mali? Return to Map of Africa. Find the equator.Now find the lines of latitude known as the Tropic of Cancer and the Tropic of Capricorn. Which is closest to Mali? The area lying between these lines is known as the tropics. What kind of weather do you associate with the tropics? Hot? Only if you're in a flat place. It's cool and pleasant on the top of Mt. Kenya! Steamy? Only if you're near the ocean! So what do you suppose the weather's like in Timbuktu? Access Temperature in Timbuktu: What is the average daytime temperature in Timbuktu at this time of year? Would the temperature vary very much from month to month? Did you notice how the Niger River curls its way through Mali? This river forms a highway from the mountainous jungles of Guinea to Timbuktu—and beyond. Access the Niger River Basin Map. Follow the river from its source in Guinea to where it loops southeastward (just beyond Timbuktu), then on to its mouth in Nigeria. What countries does it flow through? Go to the map of Mali. Locate Timbuktu. Do you see the lakes? (Lac is the French word for "lake.") How can there be lakes in such an arid land? Now find Bamako. See the airport? Get your ticket and fly to Bamako! When you get there, find your way to the Niger and catch a ride downstream on one of the boats. Destination: Timbuktu. Return to Mali: Geography and History. Read paragraphs 3 and 4. In what three ways has the Niger River been the source of subsistence for local inhabitants? How often does the river flood? In earlier times, what major products were transported along the river? What do you see as your boats proceeds along the river? Got your camera ready? View the fishermen on the river. Piroques like these have been used for fishing and transportation along the Niger since ancient times. The prime farming area of the Niger is the inland delta in Mali.Like the Nile River of ancient Egypt, the Niger floods its banks once a year, depositing a rich new layer of silt on the floodplain in this wide, flat stretch of land. Access Landscapes. Read the first paragraph. During what time of year is the annual flooding? About how much land is covered? Now you know why there are lakes in the desert and the sahel! Inland Niger Delta Landscape. View the close-up map of the delta and floodplain at Inland Niger Delta. Notice that Timbuktu lies in the Sahara Desert, a few miles inland from the river. Getting hungry? Go to Wonders: Niger River. Read the second paragraph. What four food economies thrive in the region of the inland delta? What should you order for lunch? Fish fritters? Boiled rice? How about a hamburger? What uses of the Niger did you find that haven't been mentioned before? “a fisherman's tale.” In what ways does life along the river continue much as it did centuries ago? Get out that notepad and jot down some descriptions of life along the Niger. Write a letter to the producers of Globe Trekker. Describe the parts of Mali you have visited so far. Remember—you're trying to convince them that this is a great place for an upcoming TV episode. The ancient city of Timbuktu lies in West Africa in the present-day nation of Mali. This is a region of varied landscapes, ranging from sizzling desert sands to tropical jungle. The Niger River that flows through Mali has been an important trading highway as well as a source of subsistence for the local people since very early times. In this lesson, students will learn about the geography of Mali. Become familiar with the lesson plan and bookmark important websites. You might wish to download and duplicate the map of North Africa available at Outline maps: available through EDSITEment-reviewed resource Internet Public Library. Hand out copies of the map of North Africa found at Outline maps: Have the students indicate with colored markers the Sahara Desert, the sahel, and the savanna. Then have them label the following: Niger River, inland delta of the Niger, modern-day Mali, Guinea, Niger, Benin, Nigeria, and the city of Timbuktu. As a follow-up activity, instruct the students to write a short essay about the Niger River. Preliminary to this activity, explain that a Greek historian (Herodotus) once described ancient Egypt as "the gift of the Nile" After discussing the meaning of this quotation, have the students think about ways in which Mali might be considered "the gift of the Niger." What are the major geographical features of Mali? In what part of Mali is Timbuktu? What critical roles has the Niger River played in the lives of the people of Mali? How much have conditions changed?